Simpson Strong-Tie has redesigned its EB-TY Hidden Deck-Fastening System by integrating a 316 stainless-steel reinforcing plate that prevents screw over-driving and adds stiffness to the concealed fix system to not only hold boards securely but maintain flexibility when seasonal contraction and expansion of the timber occurs. To make installation easier, the innovative patent pending EB-GUIDE precisely positions the location of the screw through faster pre-drilling at the correct angle giving you consistent spacing, and a uniform height. 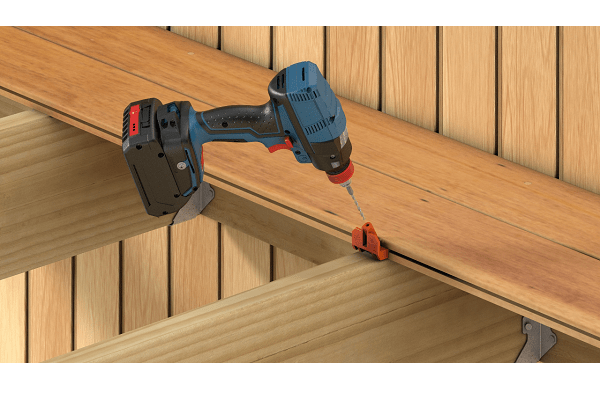 This combined with the chamfered edges of the EB-TY PremiumTM allows for easy insertion of the timber decking board and all screwed in place with 7-gauge x 55 mm 305 or 316 stainless steel fasteners (model dependant). Each box comes with 175 EB-TY Premium biscuit fasteners, 190 screws, 12 Merbau style hardwood plugs for first and last decking board, an innovative EB-GUIDE, 1/8&quot; (3 mm) quick-release drill bit and a T-15 6-lobe quick release driver bit (can be used with an impact driver).